The Makah tribe could soon be hunting gray whales again, under a proposal from the National Oceanic and Atmospheric Administration (NOAA) that would grant a waiver to federal marine-mammal protections. The tribe on the northwest tip of the continental United States last legally hunted gray whales in 1999, in its first known gray whale hunt in more than 70 years. The hunt revived a cultural tradition lost after nontribal commercial exploitation of the whales drove them nearly to extinction. Protection under the Endangered Species Act beginning in 1970 allowed gray whale populations to thunder back, and they were removed from the list of endangered species in 1994. In 2017, an estimated 27,000 gray whales in the northeastern Pacific migrated between calving grounds in Baja and feeding grounds in the Arctic. 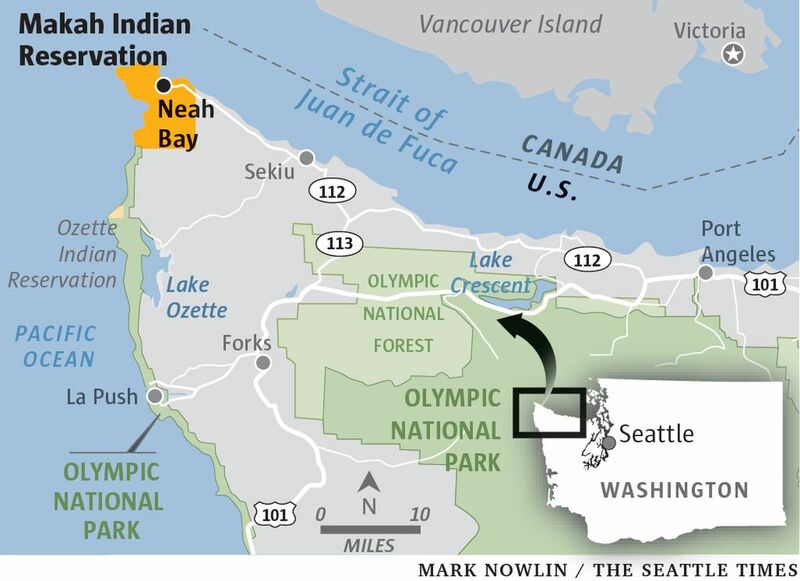 The grays are migrating north off the Washington state coast now, in one of nature’s longest treks. 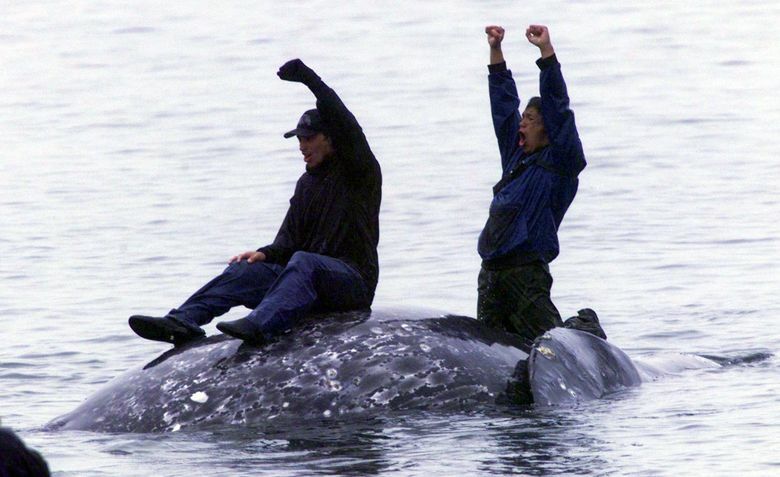 The hunt on May 17, 1999, was a triumph for the Makah tribe, the only tribe in the United States with an explicit treaty right to whale. Meat from the whale was shared in feasts and celebrations on the reservation. But subsequent hunts were mired in lawsuits and administrative procedures. 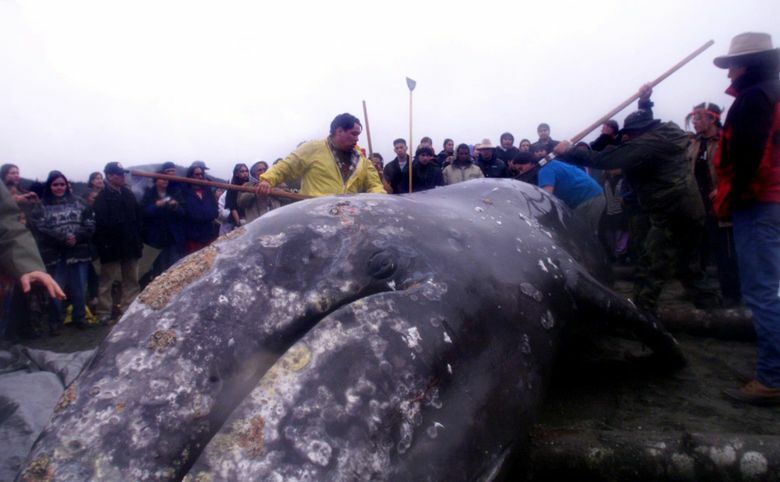 Further controversy erupted after five Makah tribal members illegally hunted and killed a gray whale on Sept. 8, 2007. Two tribal members ultimately did jail time for killing the whale, which was struck and lost without ever being harvested. The waiver of the Marine Mammal Protection Act, sought by NOAA on behalf of the tribe, is subject to a public hearing before an administrative law judge Aug. 12 in federal court in Seattle, where the agency must present its case for the waiver. Anyone may participate in the hearing but must notify the government via certified letter by May 6. Any person who wants to participate as a party in the hearing should also send an electronic copy of this letter to aljseattle@uscg.mil. The hunt NOAA proposes is limited. The tribe had sought permission to harvest as many as 20 gray whales every five years. Instead, the agency proposes a limited hunt and a sunset on the waiver after 10 years. The tribe must get a permit from NOAA before any hunt. The strike would be made by toggle harpoon, and the kill by a .50-caliber rifle, the better to kill the whale quickly. The first permit granted would be good for three years. Special protections are proposed for the more than 200 gray whales that frequent the Neah Bay waters off Washington’s northwest corner. While not designated by NOAA as a separate stock, those whales are recognized as a local feeding aggregation. To avoid them, and also to protect public safety, no hunt would be allowed in the Strait of Juan de Fuca. Other protections for western gray whales — a depleted stock that can mingle with eastern grays — would further limit hunts. NOAA proposes that the tribe kill no more than three whales per year in even-numbered years, and only one whale per year in odd-numbered years. The seasons would run from Dec. 1 through May 31 in even years, and from July 1 to Oct. 31 in odd years. The hunts would be for ceremonial and subsistence purposes only, and no commercial sale of the whale meat would be allowed. Patrick DePoe was in high school the last time the tribe legally hunted a whale; he helped tow it to shore from a canoe and haul it up onto the beach at Neah Bay. He remembers snacking on blubber stripped off the whale as it was being butchered, and the taste of the whale’s red meat at a ceremonial feast held at the tribe’s high school gym. NOAA sees no conservation issue in reopening the hunts. But opening hunts of a beloved cetacean is sure to be enormously controversial, as it was the last time, when some animal-rights groups and environmental organizations protested — both legally and illegally. Some took to the water in Jet Skis and boats seeking to block the whalers, despite their valid permit to hunt. The soonest a hunt would likely occur is next year because of multiple further steps required both of NOAA and the Makah tribe, including issuance of a permit.